The death toll in the Mariupol shelling in eastern Ukraine has reached at least 30 people, local authorities say. Kiev and the militia are trading blame. The rebels insist they don’t have weapons close enough to attack the city. “Twenty-three people died at the scene, including one child. Another 93 people have been injured, including eight children,” a statement from local authorities said. Another seven people died in hospitals, it added. But Ukrainian Interior Minister Arsen Avakov later said that 102 people have sustained injuries. Two children – a 15-year old girl and a boy “about five years old” are among the dead, the statement reads. “Our militias have no weapon systems near Mariupol that would be able to shell that region. Our positions are simply too far away,” a spokesman for the Donetsk militia headquarters told RIA Novosti. “According to our intelligence, the artillery fired from the Stariy Krim neighborhood [less than 10 kilometers from central Mariupol]. Ukrainian troops are stationed there. We believe it was a provocation committed by the Ukrainian troops,” the spokesman added. "It is all clear, who shelled Mariupol: from which regions they are, from which spot and where the artillery was located. As far as I know, [rockets were] fired by a Grad multiple rocket launcher. Our militia units don’t have artillery capable of reaching the location of the shelling,” Pushilin said. The comment comes after a local Ukrainian Interior Ministry official accused their opponents of shelling the city some 110 kilometers south of the militia stronghold in Donetsk.The assessment was confirmed by Eduard Basurin, a military official in the self-proclaimed Donetsk People’s Republic, who told RT that the rebel forces are not conducting any offensive on Mariupol at the moment. Mariupol City Hall earlier said that 16 people were killed and 83 injured. Several rockets have hit a residential area, seting several cars on fire and damaging a building. They are presumed to have been fired by a Grad multiple rocket launcher. The strike hit Kyevskaya Street in the eastern part of the city. Ukrainian authorities said it was fired from an easterly position between the villages of Zaichenko and Sakhanka some 35 kilometers distant, according to Interfax-Ukraine. The militia’s claim puts the position of the launcher in a neighborhood about 30 kilometers west of the attacked area. The city police said two checkpoints outside Mariupol were fired at on Saturday with no casualties reported. The OSCE said it has dispatched people from the Mariupol observer mission to the area hit by artillery fire to conduct a fact-finding mission on the ground, according to RIA Novosti. The organization is expected to report on the situation later in the day. “I condemn this violent act in the strongest terms and call for a full investigation of the incident. I also convey my most sincere and deep condolences to the families of the victims and to the people of Ukraine,” the Head of the OSCE Special Monitoring Mission to Ukraine, Ambassador Ertugrul Apaka, said. "This dangerous situation can’t continue. We need an immediate ceasefire. Ukraine and its people need and deserve peace. The parties must return to the negotiating table without further delay and implement fully the Minsk agreements." However, the deputy speaker of the DPR parliament Pushilin has blamed Ukraine for “doing everything possible” to suspend peace talks. The Ukrainian government has called on its Western backers to immediately convene an emergency meeting of the UN Security Council to discuss the development. The request was sent by Prime Minister Arseny Yatsenyuk to the ambassadors of the G7 member states. Kiev’s troops and militia forces are locked in renewed hostilities after a shaky ceasefire has utterly collapsed. Kiev launched a massive offensive last week, but failed to gain any ground. Hopes of hostilities being deescalated are slim, with officials from both sides voicing their intention to continue fighting for their respective causes. 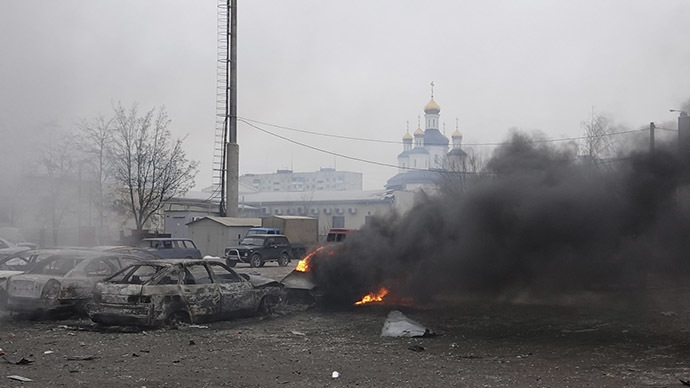 Mariupol, on the Azov Sea coast in the Ukrainian Donetsk region, remained relatively insulated from violence, which was focused to the northeast.